Hello. I'm curious about something. I would like to make a Live CD/DVD for a very specific purpose, but I don't know what to use. Basically, it's main function will be to run Windows games without booting to the hard drive. I don't intend to run the games on the CD itself. The second thing neccesary is to to be able to copy or write files to an ntfs filesystem, so I'm not sure how well a Linux Live CD with WINE would do. Finally, I would prefer it to be as fast as possible. The system that will be using this CD is a Dell Latitude running Windows 7. I don't expect you guys to do all the work; I just want suggestions. Thanks in advance! WHICH "kind" of games? I am not a gamer, but I believe that WINE has issue with graphic cards. WHY a CD/DVD? (and not a USB stick which is more "flexible" and usually much faster). How much memory (RAM) has that PC? The "faster" solution is running an OS completely in RAM, but you need "enough" of it (plenty) and loading it from a CD/DVD might be anyway very slow (initially). The games aren't ultra-new or anything like that. They just need hardware acceleration support. They will also be used for a lan setting courtesy of a wi-fi network. CD/DVD and USB doesn't matter, except that I don't have any working USB flash drives bigger than my 4gb jump drive. I'm sorry, but I don't have the amount of RAM the computer uses offhand. I mentioned that it ran Windows 7 (though I don't remember the exact version, though it's most likely either Professional or Enterprise. I don't know whether it is 32-bit or 64-bit, but I'm betting 32-bit. I don't care what OS the CD uses, as long as it isn't older than Windows XP. I'm not doing this for my own computer, but a friends (with permission), so that explains why I don't have the exact specs of the laptop on the top of my head. The fastest way and probably best way (for games) would be to run a reduced Windows in RAM (when possible), which image is located on a local HDD. second best for games, but more portable. Option 1 is not an option, since the whole point of the live cd/dvd/usb is to actually run programs that the computer refuses to run due to strange and unmentionable restrictions. Replacing the OS entirely is also not an option. You asked (possibly without realizing that) about how to run an "alternate OS" capable of running games. Maybe you should take your time trying to understand what the two suggested projects do, before saying they don' t fit your request (they BOTH do). Since you dont' intend to "run the games on the CD itself" that should mean that you are ready to host the games on the hard disk, if this is the case, you could also host there a single additional file containing the "alternate OS" (and that would be largely faster than a USB hard disk, which will be faster than a USB stick that will be faster than a CD/DVD). Are you saying that I can put the VHD file on the hard drive and boot to it via grub4dos on a usb or live cd, and by doing so the OS can run faster than through a live cd/usb drive? Sorry if i'm repeating the obvious. You can put the bootloader whereever you want. The loading speed of the image, in case of a RAM loaded system or the running speed of the OS, in case of a non-ramloaded system, depends entirely on the speed of the medium, which hosts the VHD or WIM. So yes, running or loading the VHD or the WIM from an internal HDD is the fastest possible way. btw. There's no need for G4D, i run VHD and WIM directly from Win7 bootmanager. I have read somewhere that the ability to boot to VHD files can be blocked by the administrator. Since I am trying to avoid modifying system files, I would prefer a portable bootmanager, if such a thing exists. Can I load grub4dos on a live cd or usb stick and boot from the VHD file on the hard drive, or is that not possible? If it is, how would I do it? Since I am trying to avoid modifying system files, I would prefer a portable bootmanager, if such a thing exists. Can I load grub4dos on a live cd or usb stick and boot from the VHD file on the hard drive, or is that not possible? If it is, how would I do it? allow using Win7/8/7PE OS to make Boot files e.g. 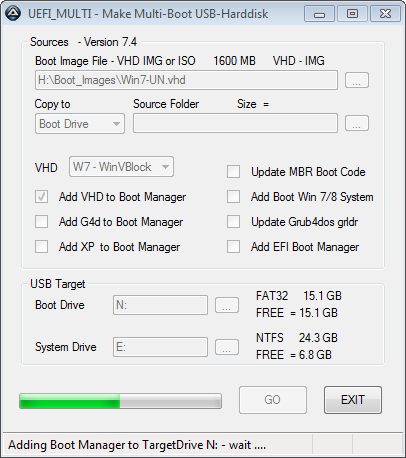 Boot Manager Menu and/or Grub4dos Menu on USB-stick for VHD on HDD. What type of Windows Setup Source Or what existing Boot Image file do you have already ? Give Setup Source Version (XP / Win7 / Win8) and Architecture (x86 / x64) and Edition (Ultimate / Professional). I have read somewhere that the ability to boot to VHD files can be blocked by the administrator. Maybe if you use Windows 7 "native VHD" booting (which is only available in some versions ), definitely NOT if you uses grub4dos and one of the "third party drivers" such as firadisk or winvblock. Since I am trying to avoid modifying system files, I would prefer a portable bootmanager, if such a thing exists. Can I load grub4dos on a live cd or usb stick and boot from the VHD file on the hard drive, or is that not possible? Sure it is possible . You need maybe some piece of info. There is often a lot of confusion between a bootloader (or OSloader) and a bootmanager. A bootloader or OSloader ONLY loads a given OS. A bootmanager can boot more than one OS by chainloading different OSloaders. The confusion is due to the fact that commonly used files such as NTLDR (up to Server 2003) and BOOTMGR (Vista and later) are at the same time a OSloader AND a bootmanager, as well grub4dos is at the same time an OSloader (for Linuxes) and a bootmanager. A bootmanager is always actually a minimal Operating System that does whatever it is supposed to do (very limited in the case of NTLDR and BOOTMGR) and then chainloads an OSloader. We can say that NTLDR and BOOTMGR are mainly OSloaders with some bootmanager features, whilst grub4dos is mainly a bootmanager with some osloader features. As a matter of fact grub4dos is not only an advanced bootmanager but it has developed in a (of course minimal/limited) real Operating System, including a large number of internal commands, a number of installable modules, the possibility of running programs (that need to be explicitly written for it) and executing scripts (that use a batch language very similar to the NT one). If it is, how would I do it? to have an idea of the different ways and devices on which you can use/install/boot grub4dos. Consider that recent grub4dos versions have some added capabilities when compared to the versions in use at the time of the writing of the guide. Once you have a better idea of the thingy and it's operation, feel free to ask more specific questions. Sounds like you're not looking for what you've claimed you're looking, but for a way to circumvent security restrictions. How about just installing VMWare or similar on the pc and making your own Virtual machine for gaming. I do that when I need to test my rescue disks or run winbuilder. That way I don't mess up my main pc, and it has advantages such as suspending the VM in seconds and resuming later on. Well, does administrator allows this usage at all? Is the internal hard disk boot time encrypted? 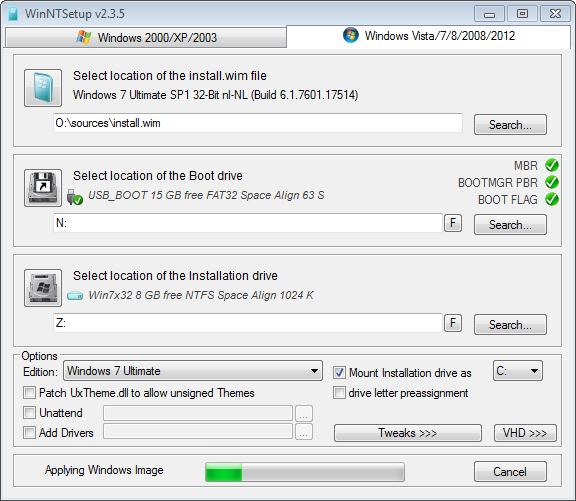 What about boot a full windows 7 from USB and disable in ternal mass storage controller driver?